It only took about 68 years, but World War II veteran Jerome Schneider of Waterloo received his proper commendations during a Friday ceremony at Waterloo City Hall. U.S. Congressman Bill Enyart presented various medals to the 96-year-old for his distinguished service to this country. It was something long overdue, and started with a simple conversation between Schneider and his son-in-law. “We were talking about him never receiving his World War II Victory Medal, so I thought I’d ask Mr. Enyart for help,” said John Herrington of Smithton, husband to Jerome’s daughter, Allison. The Victory Medal was awarded to all U.S. military members who served in active duty during World War II. Herrington said Enyart showed him the proper paperwork to file and other steps needed to recognize his father-in-law. “It was great for the congressman to help,” he said. Just five months later, Enyart presented not only the WWII Victory Medal to Schneider, but also the American Campaign Medal, European-African-Middle Eastern Campaign Medal and Bronze Star Attachment, Army of Occupation Medal and Germany Clasp, Marksman Badge and Rifle Bar, Good Conduct Medal, and Honorable Service Lapel Button. “I only thought I was getting one,” Schneider told the Republic-Times during an interview at his home on Monday evening. Another of Schneider’s daughters, Angela Kirleis, said the family has cleared a space on the wall for his new medals and plans to display them prominently in a case. Jerome Schneider back in his military days. 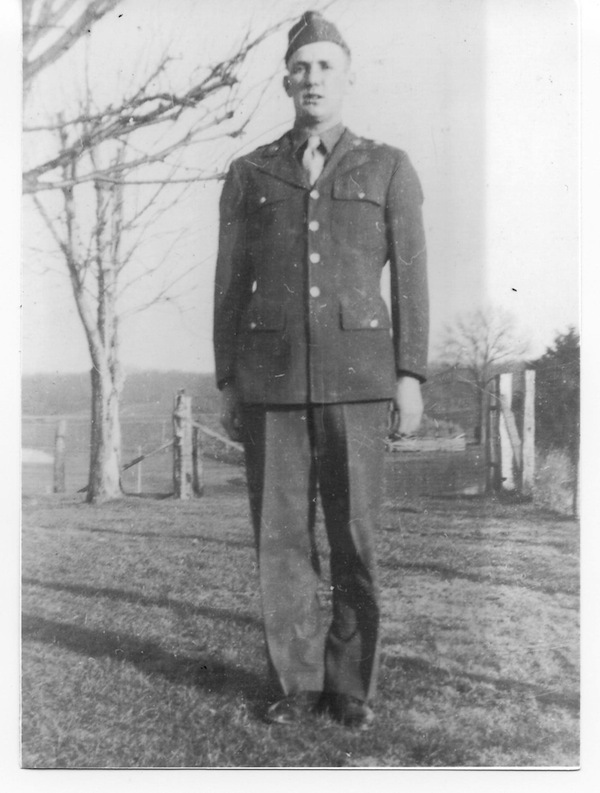 Schneider, who grew up on a farm in Waterloo and attended Deer Hill School, entered the Army in 1942 at the age of 24 and was stationed with the 248th Engineer Combat Battalion Company C out of Camp Bowie in Texas. He was deployed to France in June 1943, and went on to serve until Christmas 1945. Schneider served in Normandy, Rhineland, Northern France and Central Europe during this time, building bridges and putting out minefields. As for the country’s military conflicts across the world today, Schneider said it is a whole new ballgame. After his return home from the war, Schneider got married, raised a family, and worked at Columbia Quarry’s Valmeyer plant for 44 years. His family resided in Valmeyer until the Flood of 1993, after which they moved to Waterloo. “I’ve had a good life,” Schneider said.